Team GB will, for the first time since 2001, face a year of track cycling without a single cyclist wearing the converted Rainbow Jersey. 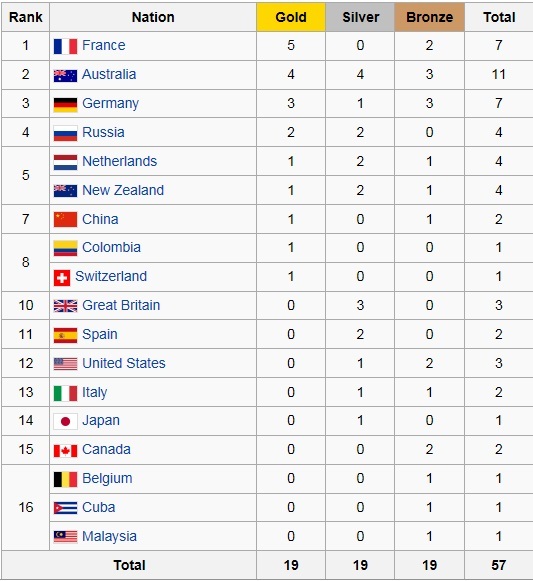 But is it really something to be worried about; in 2011 before the London Olympics Team GB only secured one Rainbow Jersey but came back to dominate the 12 months later. As a rider do you want to train for Rio or spend the year defending the Jersey and commit to an endless number of interviews and appearances. In 18 months’ time we will know the answer but for now, what went on in Paris this February. 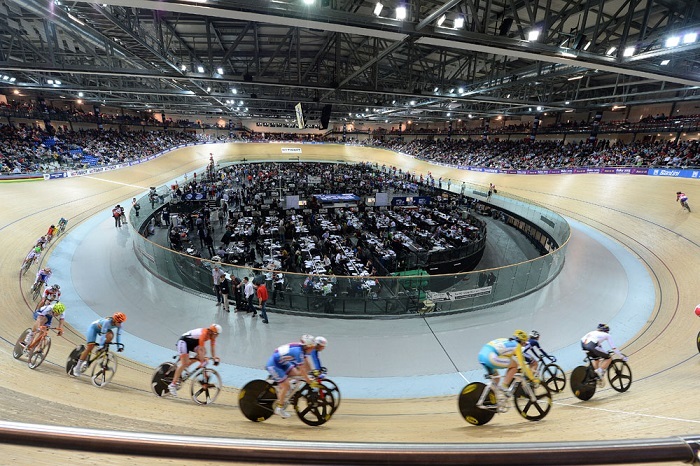 France is the home of cycling and the formation of the UCI. In 1900 the first World Championships, under their control, were held in Paris, France and this year they returned for the tenth time (but the first since 1964. The event programme features an article from the French President, Francois Hollande. Along with the customary best wishes to the competitors he explained how France had built a magnificent stadium and could demonstrate to the how they could host and event to equal any other country in the world. Hollande was not seen at the track over the whole 5 days, Sarkozy came though, and the French guy sat next to me applauded his interest in cycling, “the new guy”, [Hollande] he continued, “… is an idiot”. And if we are to believe that this was a world class venue with world class organisation then we too are idiots. 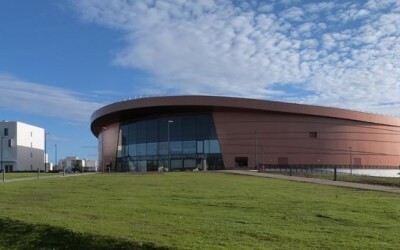 The Vélodrome de Saint-Quentin-en-Yvelines has an impressive look from the outside. Just a few meters from a major AutoRoute it’s bronze clad exterior catches the eye immediately, what you don’t see though are the expanses of grey boring concrete around the sides and base. Compare it to Lee Valley or Manchester (build in the 1994) and it is just another warehouse in a big city. Inside though is a different picture, the seating plan and glass fronted balconies, are both impressive and practical. The low track centre and glass barriers allow a clear view across the track which has short straights and is wider than usual at 8 meters. As with all World Elite Track events, with press and teams spreading across this expanse, there is no room for Hospitality, but the high balconies offer two fantastic vantage points on turns 1 and 2 ideal for the prawn sandwich brigade. Outside, after dropping our bags at a free left luggage hut (great idea!!) we were greeted by security, only to be expected following a recent terrorist attack, and nothing new for an event of this nature. This wall of muscle seem to have a different agenda though, a quick wave of their wand to detect my Uzi sub machine gun, machete and 10oz of C4, failed to find anything of interest. It gave a shrill squeal as it passed my pocket, but that’s where you keep your car keys so there was no need for Asterix the Gaul to check what it was. This rather rushed search for metal was not their prime objective though, so a full strip search followed in case I was trying to smuggle in a Kit-Kat and can of Coke – No food or drinks of any nature allowed !!! Jesting apart, we saw one old guy having his biscuits confiscated and another couple picking up two 500ml bottles of water from left luggage after the event. At this point you begin to wonder if you took enough Euro’s out of the cash point, was the paranoia on calories a preamble for a swath of outlets selling Mars Bars at a price that would wipe out the Greek debt problems. However we were pleasantly surprised – Croissant or Pain au Chocolate for a euro and four for a pint of lager, a few reasonably priced sandwiches, and coffee or step outside for a Crêpe or doughnut. The only problem for the 5000 staving inhabitants getting to the food kiosk thanks mainly the security guard stopping you walking anticlockwise around the concourse. So far, not so good for Monsieur Hollande (although his team were resplendent in orange as usual), by day 4 our new diet had kicked in and the racing continued, until Francois demonstrated his countries skill at hosting both an in-door and out-door event in the same venue at the same time. If there are 3 things that don’t mix it’s wood, a track bike and water. With a poorly designed entrance with no airlock, windows which had to remain open for television and electric cables, the humidity gradually crept up; as the outside temperature dropped condensation formed in the roof space and quickly decided it wanted a closer look at the track. Along came MOP-MAN, or should I say MOP-MEN, a sight I have never seen before and doubt will again. 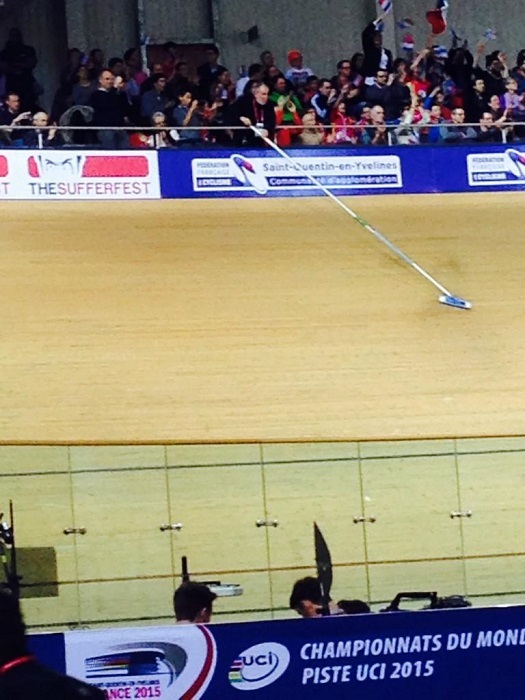 The Women’s Sprint Semi-Final, Vogul and Xhong, the riders play cat and mouse over the first half lap; As they reach the banking of corner 3, a mop extends out of the crowd half way along the back straight an proceeds to soak up the drips of condensation behind them and quickly retracts before they come round for the second lap. This not only continues for the next 2 days, but as more drips appear in different locations, so more Mop Men are dispatched. The positioning of the drips become more and more precarious as time goes by, but as most of the racing is now sprint based there is always a clear space to carry out the near military cleaning manoeuvres; the challenge (or entertainment) would come with the Madison. Much to our disappointment by the time the Madison came around the French had mopped up all of the drips and the sprint medals – Kilo, Keirin, Team sprint and shortly afterwards Gregory Baugé finished the clean sweep with the individual sprint. You may be thinking that the whole event was a disaster but the saviour of the day, or days, made sure that this World Championships would stick in the memory for a long time. Normally the preserved of kids at the summer fete, the face paint was liberally applied to all generations of French families. As expected each home competitor was saluted with a cacophony of cheers, screams and honking horns, but that was only one part of the physic of the home crowd. Every day for every session the crowds flocked in as soon as the doors opened, the normally quiet afternoon qualifying sessions seemed like a Sunday night sprint final. The acknowledgement and encouragement of skilful riding was not swayed by the colour of the kit being worn, if the rider was showing that extra level of skill, endeavour or strength, you could have easily thought they were French by the support they gained. Unique to any event I have attended, respect was given to each and every National Anthem; silence by the crowd; without exception all were standing; children were told to be quiet and stand by their parents side. The only exception was for a French win when the silence was broken by a rousing ‘La Marseillaise’, word perfect by 5000 loyal citizens. Without the French crowd the World Championships would not have been a disaster, but it may well have drifted in to the status of just another track meeting. Chapeau les Parisians!!! So what of the racing? Was Team GB really that bad? In some areas yes, but in others you have to accept that one day the rest of the world will catch up. The pursuit teams both performed to schedule, but the tactical error was to not appreciate that the Aussie Girls we capable of breaking the World Record by 3 seconds and the New Zealand Men’s team have finally learnt to control their aggression over 16 laps not for 10 (before blowing up). Some of the racing is a non-event with teams electing to concentrate on the Olympic disciplines and enter novices in the other races. V-Sprints’ Jess Varnish had a slow start in the Women’s Team Sprint but recovered to post a respectable 19.037 for the opening lap, to push here and Vicky Williamson to an 8th place finish in an event with low expectations. Jess’ sprinting skills are still growing, she reached the final 8 on merit alone. No favours, or luck of the draw, a qualifying time of 10.804 was a personal best and ranked her 6th for the match sprints, only 2 tenths off the fastest time. Round 1 was easy, Round two brought her up against Anna Mears, now the most decorated Women Track Sprinter, but Jess rounded the last corner in a perfectly timed manoeuvre to finish ¾ of a bike ahead in a comfortable win – one of less than a handful of riders to overtake on the last corner. Stephanie Morton was next, the first sprint could only be split by a tyres width, giving Morton the advantage and putting the pressure on Jess for the next round. Jess went out with her head held high, top 8 will now be a regular feature for her and soon it will be higher than that. Perhaps the most disappointing aspect to the Team GB performance was the Men’s Sprint events. In the Team Sprint they broke apart, in the Individual and Keirin Jason Kenny was out in the first round repechage. Sunday was a write off with a stomach bug sweeping through the GB Camp. 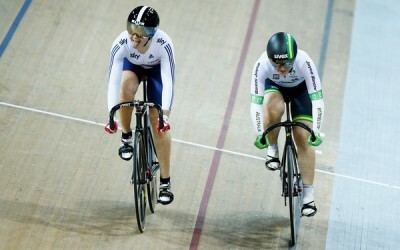 Jess competed but was in no condition to walk never mind ride a bike, a cruel blow as the Keirin finals were weak. There will always be ‘what if’s’ that we will never be able to answer, but a final race containing 3 riders who have never featured before, a Chinese rider exhausted from 3 days hard competition, gave Anna Mears an easy (but well earned) win. The very same Anna Mears that Jess had dispatched in the sprint competition a couple of days earlier. In the Men’s sprint competition there was no GB rider in round 2! 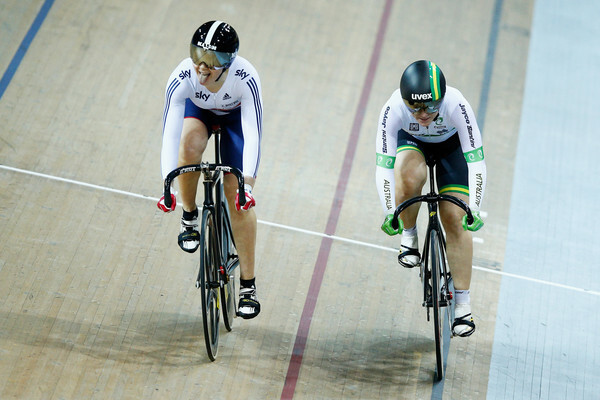 Laura Trott has become a banker in recent competitions, but even she only managed 2nd place. The men’s endurance riders offered nothing to shout about with the exception of Andy Tennant who posted 4:20 to finish 5th in the 4 km individual pursuit. Plenty for the coaches and riders to do in the next 18 months to prepare for Rio, but don’t write off any rider just yet, and failing any improvements we can bring the GB Swimming Team to the Paris Aquadrome in the future. The French on the other hand were at the other end of the scale. Yes, it is their home track but the Sprinters were absolutely dominant. Once the Team Sprint was awarded to France following relegation of the New Zealand Team for a clear changeover infringement there was little doubt that France would clear up all the Sprint events. Francois Purvis took on the Keirin from 2 laps out and looked so comfortable and at ease he could have stopped for a bowl of escargot on the way around and still won. The next day he was back to win the Kilometre Time Trial, and again on Sunday he featured in the individual Sprint, with three Frenchmen in the final eight. Quentin Lafargue was placed in Bronze position and Gregory Baugé won the Final to make it four out of four sprint medals for the French men. The Aussies women were successful in the Pursuit, Keiren and Omnium with Annette Edmondson marking out Laura Trott in points race to win in a tactical finish. The Omnium is a weak event now, both in the women’s and men’s events the quality of the field was a long way off the pace of the individual event athletes, although most of the Omnium riders took part in the endurance events as well. Kirsten Wild from the Netherland won the (standalone) point’s race and then less than ½ later came 3rd in the Omnium Devil. The UCI have to do something to liven up this event, the change this year to complete the event with a points race has made it possible to see the final race develop rather than being a drag race Time Trial. For the aficionado’s, watching the men’s and women’s events provided some real interest, whilst most of the crowd were busy watching the race leaders, the top four in both Men and Women’s races gave an ‘A’ class demonstration of in tactical riding. The Chinese smashed the Women’s Team Sprint World record 18.3543 for the opening lap and then a 13.681 for a total of just 32.034; Putting that in to context in 2007 Shinaze Reade posted a 19.3 and, with Victoria Pendleton, won the world championship on 33.630, Jess and Vicky Williamson came 8th with a 33.583. 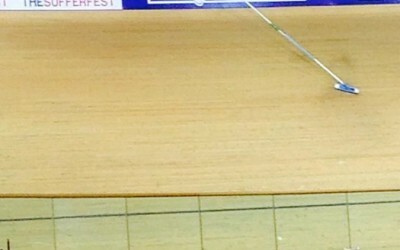 Vogul retained her Individual Sprint title; The 500m title went to Voynova of Russia and with Mears winning the Keirin, the women’s sprint medals were well spread across nations. It is rare that the 4KM Time Trial will whip up frenzy, especially if the rider is not from the home country, but Swiss Stefan Kueng rode a masterful race against Jack Bobridge of Australia. His ride was controlled to perfection, after falling of 3.5 seconds behind, the metronomic pace was maintained until Kueng was pulling back 4 tenths or more each lap to win by less than 2 tenths. The time differential between fastest and slowest lap (excluding the start) was least than 0.6 seconds and he was in second place until the final 125 meters; A well-deserved Rainbow Jersey.